As reported in The Scotsman, this photograph was taken by Ian Bremner, 58, who was driving around the Highlands when he saw something bizarre doing the backstroke in Loch Ness. Bremner, who works at a whiskey distillery, told The Scotsman that he was out trying to capture images of red deer, but found a much more sought-after prize in his viewfinder instead. (Note to Bremner: you'll probably have better luck finding deer if you're not pointing your camera into a large body of water.) “When I saw it on my screen I said ‘what the hell is that?’" Bremner said. The Loch Ness Monster, as you may know, is a long-necked, one or more humped beast that folks have been searching for since the 1930s. 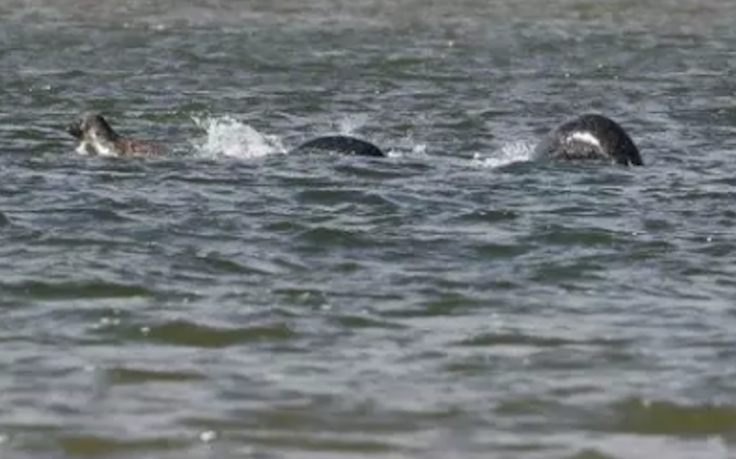 “I’m normally a bit of a skeptic when it comes to Nessie and I think it’s just something for the tourists," Bremner said, "but I’m starting to think there is something out there." Is it really the fabled monster or a close-up of a garter snake in someone's swimming pool? We'll take the whiskey-loving photographer's word that it's the real deal. Happy weekend everyone!